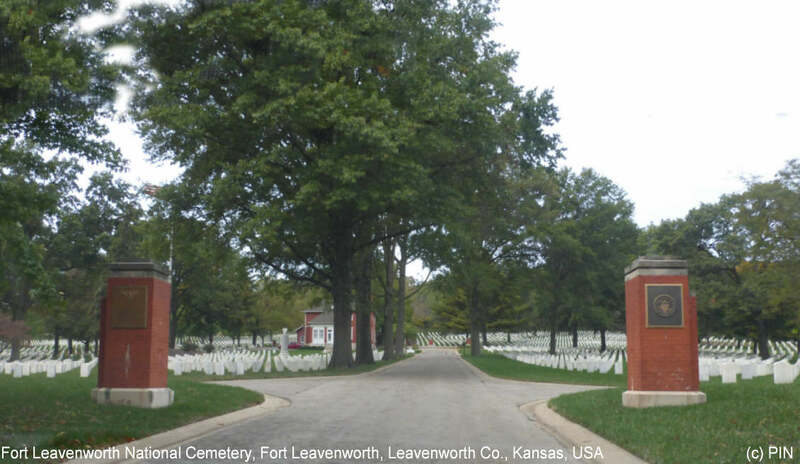 When Congress approved the creation of national cemeteries in 1862, the Fort Leavenworth cemetery became one of 14 national cemeteries to be designated or established as such that year. Of the original 14 national cemeteries, Fort Leavenworth National Cemetery was the largest and contained 36.10 acres. The oldest known burial at Fort Leavenworth National Cemetery is that of Clarinda Dale who died Sept. 21, 1844. She was originally interred in the old Fort Leavenworth Arsenal Cemetery. The oldest known military grave is that of Captain James Allen, 1st U.S. Dragoons, who died in August 1846. Like Miss Dale, Capt Allen was originally buried in Fort Leavenworth Arsenal Cemetery and later moved to the national cemetery. The cemetery office is open Monday thru Friday 8:00 a.m. to 4:30 p.m. It is closed federal holidays except Memorial Day. The cemetery is open daily from dawn until dusk. Please visit their web site for more information. The cemetery is located on Fort Leavenworth Army Installation. From Kansas City International Airport, take Interstate 29 north 7.5 miles to Platte City (exit 20). Turn left and proceed through Platte City to Highway 92 and turn west for 8.5 miles. After crossing the bridge into Leavenworth continue to the second stop light. Turn right on Grant Avenue (you are now on the Army Installation) and go to the second stop light and turn left on Cody. Bear to the right around the golf course onto Biddle Boulevard. The cemetery is on your left. The protocol for entering the base has changed. As of 2015 you must obtain a visitor's pass (still need photo id) at the white trailer located near the entrance on Sherman Avenue, immediately East of the Main Gate to the Fort.